Dystonia patient Michael Richardson enjoys hiking with his son, Eddie—one of many activities that wasn’t possible before his DBS surgery. Michael Richardson first experienced symptoms of dystonia, a movement disorder characterized by involuntary muscle contractions and spasms, when he was 13. "When I walked, I would put the toe of my left foot down first. My dad would say, 'Walk right,' but I couldn't change it. Over time, it got worse. My foot contorted. I finally had to use crutches, then a wheelchair on and off," he says. "My arms became involved—my biggest struggle was with writing. I couldn't write at all with my dominant hand, so I learned to write left-handed." These exaggerated movements are called "overflow"—a common occurrence among dystonia patients, says Mahlon DeLong, William Timmie Professor of Neurology at Emory's School of Medicine. For example, if dystonia patients are asked to wiggle a toe, their whole leg will start moving. Or if they try to tap their index finger and thumb together, their arm will swing. "Imagine trying to force two positive magnets together," says Richardson. "The more intent I was on writing, the worse it became." He had the same problems when trying to bring a cup to his mouth, or using a fork to eat. The son of American missionaries, Richardson spent his teenage years in Mexico, where a pediatric neurologist treated his symptoms with Botox shots and oral medications. This allowed him to walk, but there were side effects to the medication, such as drowsiness. "Cold, stress, being tired could all be triggers, and the symptoms would get even worse," he says. Dystonia is the third most common movement disorder, says DeLong, after essential tremor and Parkinson's. "It doesn't get as much recognition because it can occur in so many different ways and locations," he says. 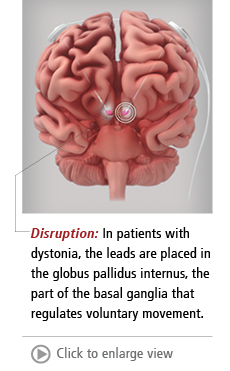 "Generalized dystonia is most common in children and young adults, whereas focal dystonias show up later in life and can affect virtually any part of the body—neck, eyelids, jaw, hand . . ."
Richardson moved back to the US for college. After graduation, while working for Verizon, he would often find himself typing in phone numbers incorrectly. Even with Botox shots every three months and baclofen, an oral muscle relaxer and anti-spastic agent, he had to use a wheelchair for longer distances and crutches inside the house. That's when his doctor told him about a surgery available at Emory. 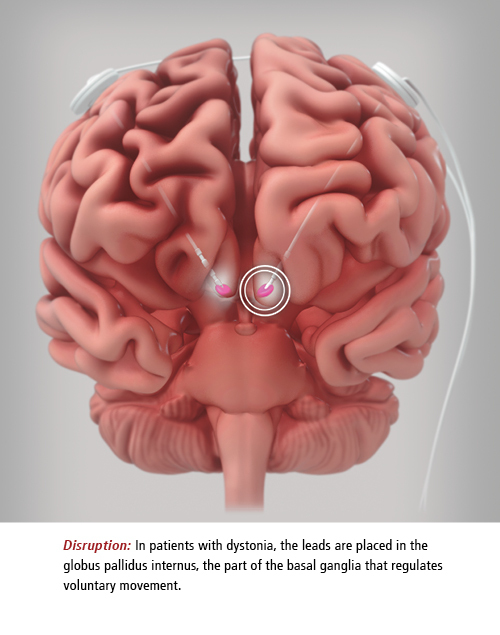 Doctors could put electrode leads into his brain and, using a battery, provide deep brain stimulation (DBS) that could reduce or eliminate his symptoms. He decided to go through with the surgery in February 2007. "They laid it all out, that my head would be bolted to the table, that I would be awake for the whole thing," says Richardson, who lives in Douglasville. "My wife, Jennifer, was pretty stressed out. She stayed up all night doing laundry. I tried to get some sleep." At 6 a.m. the morning of the surgery at Emory University Hospital, the operation started with a pre-op MRI as reference, and the frame being fitted over his head. "There was a shield above my head so there would be no contamination. Dr. Bob Gross and the other surgeons were on that side [performing the brain surgery] and Dr. DeLong was by my side, giving me commands, asking me questions, and mapping my responses." Over four decades of discovery about the mysterious basal ganglia and its role in movement and movement disorders, DeLong has become a celebrated neurologist and researcher. Last year, he received the Breakthrough Prize in Life Sciences (the "Oscar" of science) from a cluster of tech titans in Silicon Valley, including Mark Zuckerberg. He also received the Lasker-DeBakey Clinical Medical Research Award Award, among the most respected science prizes in the world, which he shared with Alim Louis Benabid of France. At his acceptance speech for the Lasker in September, he said, "A growing fascination with how the brain controls behavior led me to medicine and then to neurology. This took a clear direction when I found a choice research position at the NIH in the laboratory of renowned researcher Edward Evarts. Because the other obvious brain regions were already assigned to other fellows, I was asked to work on the basal ganglia, a cluster of poorly understood brain structures, and to determine their role in the control of bodily movement." This chance assignment evolved into promising treatments for Parkinson's disease, essential tremor, and dystonia, all of which emerge from the same motor network and are circuit disorders. "With deep brain stimulation, we're not curing or treating the disease, we're targeting the network," he says. "It's the circuit we're after." Disrupting the circuit eases or eliminates symptoms, which is a miraculous thing to witness, says DeLong. "Sometimes it takes a few weeks to achieve the full effect, but the surgery for dystonia is one of the best and most satisfying," he says. "Dystonia is a non-progressive disease—patients usually reach a level plateau. It is a pure movement disorder without any other components. After DBS, the change is profound." In Richardson's first surgery, DeLong "mapped" his brain to discover the exact areas for placement of the microelectrodes. "The target lies close to the motor and visual pathways, and we're talking about a matter of millimeters, so we need a fair amount of precision," DeLong says. Advances have allowed researchers to do this now with an MRI scanner while the patient is under anesthesia, through direct visualization, but Richardson experienced the traditional way: providing feedback while awake and alert as different areas of his brain were stimulated. The neurologists were also determining Richardson's stimulation thresholds, finding the best amplitude for the neurostimulator. "Too high and you have side effects, like movements or optic disturbances, which we don't want," DeLong says. "In the initial mapping, we gain a lot of information that helps us place the permanent electrode, four contacts and the lead, that is going to remain." Richardson recalls one test where the amplitude was ramped up until he had facial spasms, and then taken back down just below that level. The wires were left unattached and coiled under Richardson's scalp. In a second surgery a few weeks after the first, the neurostimulator was connected to the battery, which was inserted under the skin just below his collarbone. The battery is about the size of a deck of cards, and lasts three to five years before needing replacement (rechargeable batteries are now available, as well). "It took awhile getting used to the wire that ran down the side of my neck," he says. Richardson had to return for fine-tuning. "There was immediate improvement, but it took about two years to achieve the full benefit because of a setting that needed to be changed," he says. He estimates he is about 97% improved from before DBS surgery. "On bad days, 95%," he jokes. 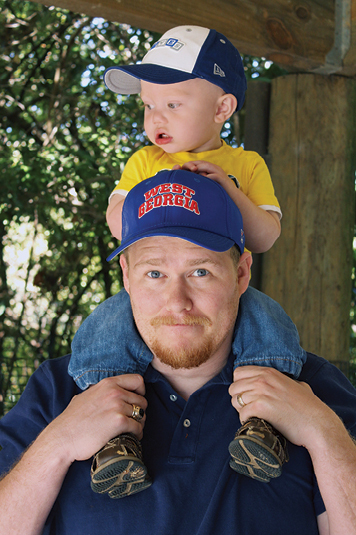 When his son, Eddie, was born, he had a vivid reminder of how much the surgery has helped. "I started to feel tired, but I thought it was just from having a new baby and not getting much sleep," he says. In fact, his battery had failed, and he regressed to being in a wheelchair in a matter of weeks, says Richardson. After a new battery was put in, he quickly returned to his "new normal." "Before I married Jennifer, I warned her that I might not be able to work by the time that I was 30 and that if she wasn't able to deal with that, we shouldn't get married," he says. Now Richardson works full time as an accounting and logistics consultant, is youth pastor at his church, Colonial Hills Baptist in Lithia Springs, and enjoys carrying Eddie on his shoulders during hikes through the mountains. "I can do anything anyone else can do," he says. "Most people don't even know I have dystonia. The risk was completely worth the benefit."